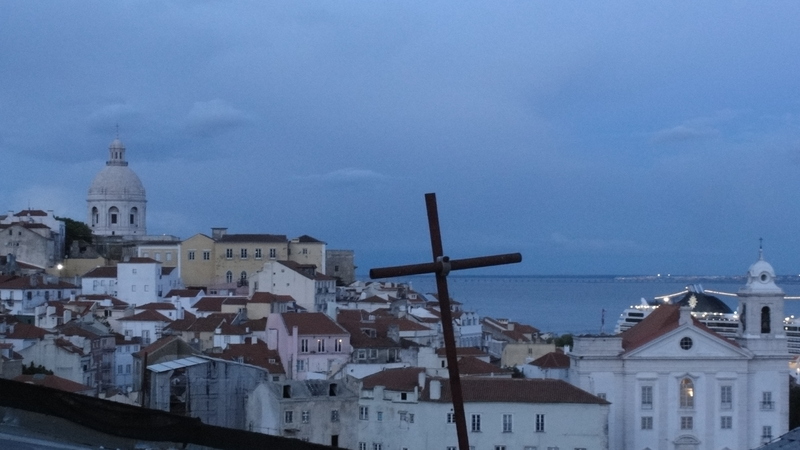 2 days in Lisbon – Part 1 | It's a Wonderful World! Lisbon immediately captivated us with its understated, unpretentious charm. It perhaps does not equal Paris in glamour or Rome in grandeur, but Lisbon with its glorious architecture and historic squares, packs its own distinctive flavor and evokes the bygone era where it was the capital of a formidable imperial power. A cab took us from our hotel right to the gate of the Castelo de Sao Jorge. The Castle sits on a hilltop, and its fortifications, decorated with canons, offer impressive views of the city, its red terra-cotta topped buildings and the Tagus river. The Castle has been the seat of various rulers over the course of its tumultuous history, but one fascinating detail is that Vasco da Gama, the famous explorer, was welcomed here upon his return after discovering India (my home country, of course!). In the present day, you can find yourself in the company of a number of peacocks! These beautifully plumed birds are shy but not camera-shy, and we were able to get some good pictures. The best time to go is in the afternoon. This will give you enough time to amble along the corridors and courtyards, and then catch the sun settling beyond the rooftops and into the river. View of Praca Do Comercio (Commerce Square) from the Castle. 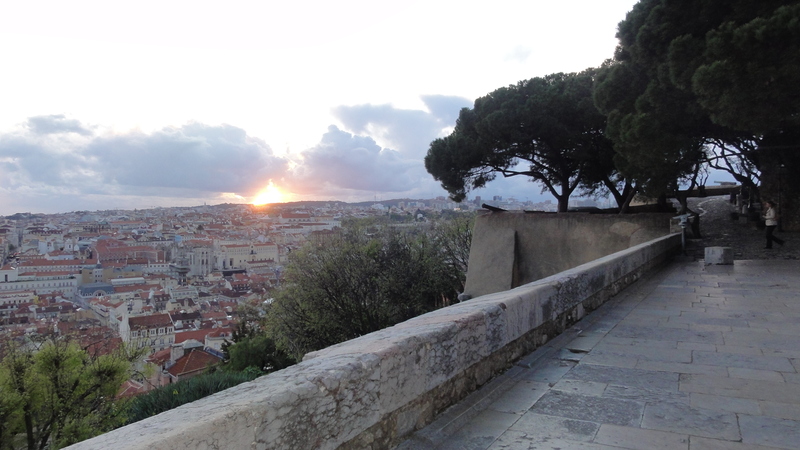 Catching the sun setting over Lisbon from the corridors and towers of the Castle. The towers of the Sao Vicente de Fora monastery are visible from the Castle. 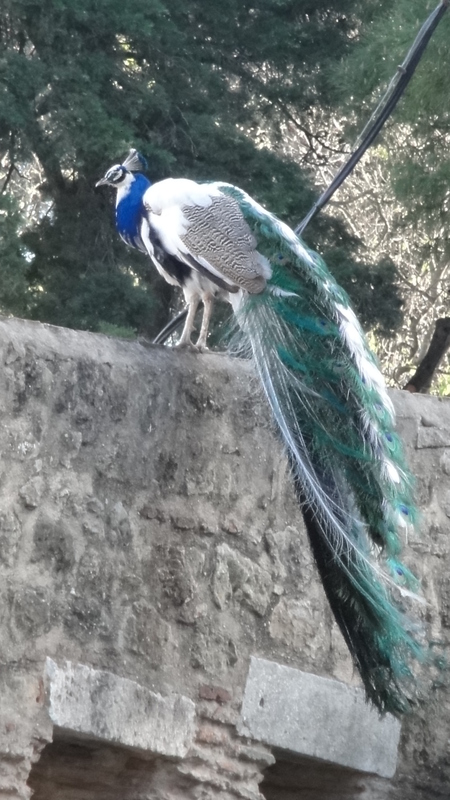 You cannot miss the peacocks during your visit. After watching the sun set over Lisboa from the Castelo de Sao Jorge, we walked down the narrow alleyways of the historic Alfama district. 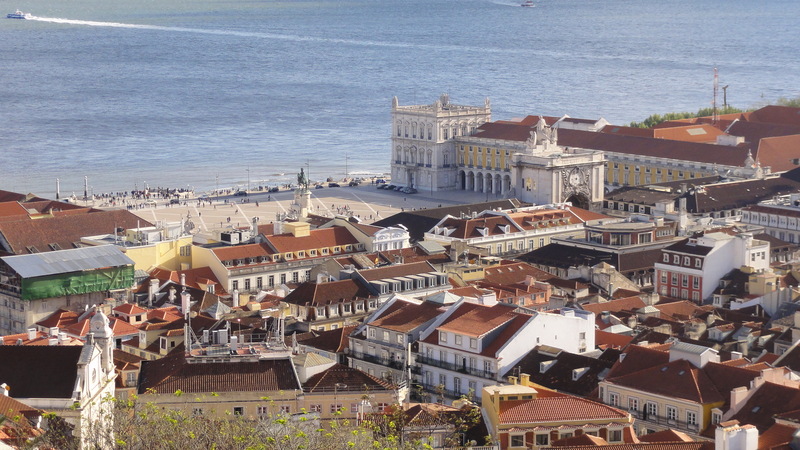 Lisbon has some celebrated lookout points, called Miradouros. We stopped at the Miradouro de Santa Luzia, and were rewarded with a view that captured for us the essence of Lisbon. We continued our descent and stopped at the twin turrets of the Lisbon Cathedral. From its outside facade, the Cathedral looked like a fortress. However, when we made our way inside, we were greeted by beautiful gothic vaulted ceilings and grand frescoes. 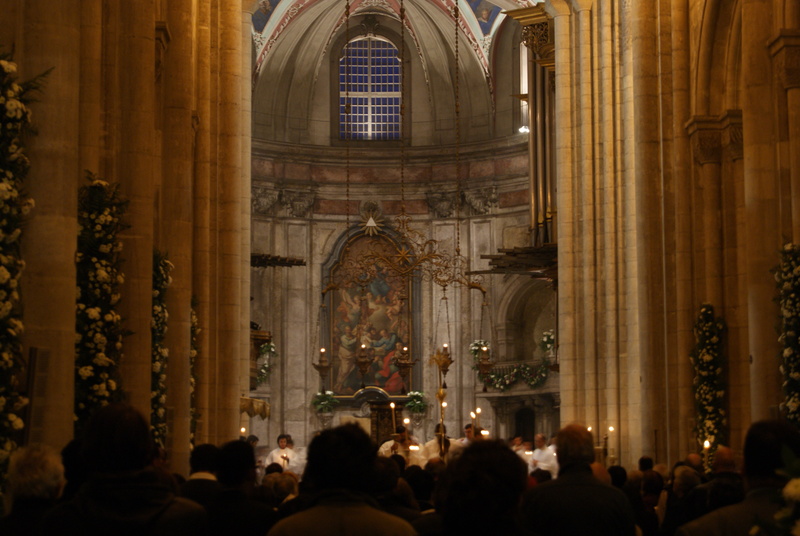 We were also lucky to witness a solemn holy ceremony being conducted by white-robed priests. We ended the night with cocktails in the Sheraton Lisboa’s Panorama restaurant, the restaurant/bar with the highest elevation in the city. 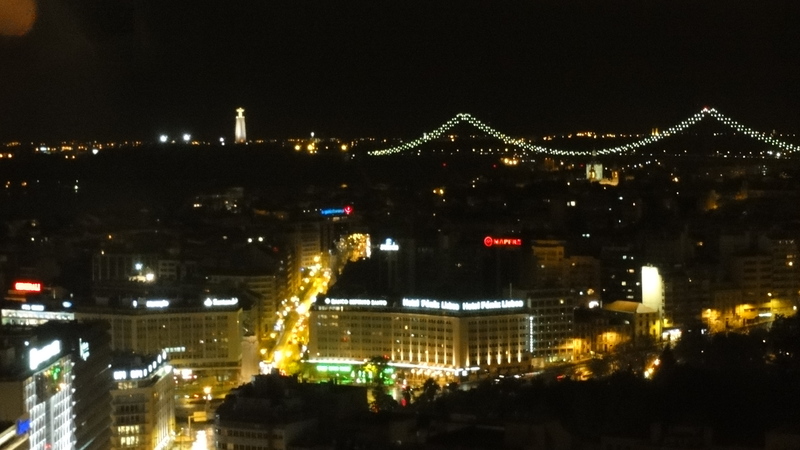 From our vantage point, we could see the lighted 25 de Abril bridge, its name commemorating the date of a historic revolution. Also overlooking the city from across the River Tagus was the shining Christo Rei statue (which bears a resemblance to the statue of the Christo Redentor in Rio-de-Janeiro). After an inspiring first day, we could not wait to unearth more of Lisbon’s treasures the next day, but more on that later. Have you visited Lisbon? What are your favorite Lisbon moments? Thanks Kamila 🙂 Hope you are doing well. 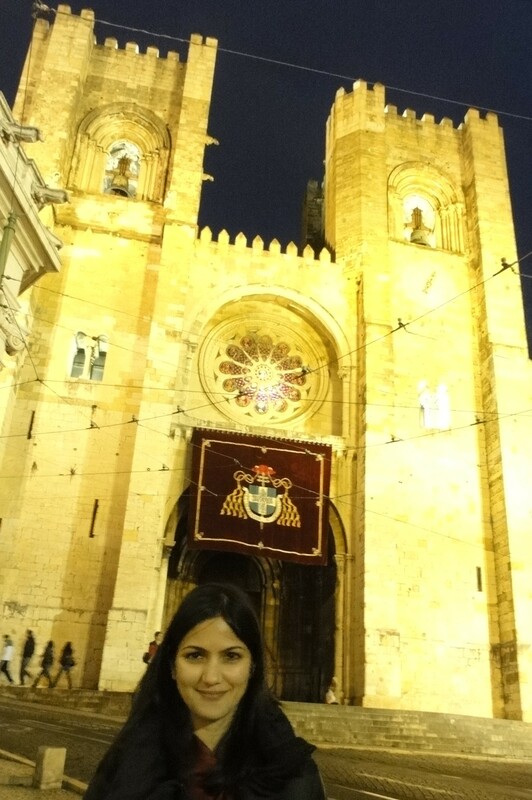 The more I hear about Lisbon, the more I want to visit! Thanks for sharing! Wow…the place is really beautiful! 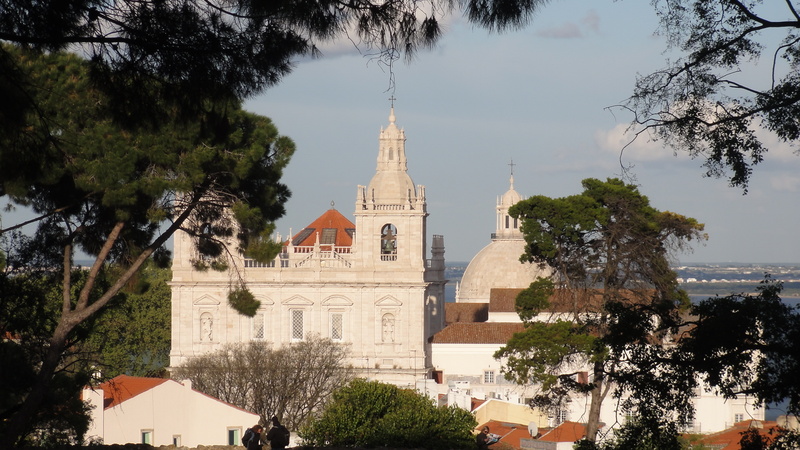 2 days in Lisbon – Part 2 | Its a Wonderful World!